The weapons used during the Middle Ages include the Medieval Swords. The Medieval Swords was predominantly used by a Medieval Knight. The weapons, armor and horse of the Knight were extremely expensive - the fighting power of just one knight was worth 10 ordinary soldiers. Medieval swords were the primary weapon of the Knights. Medieval swords changed as Medieval Warfare and armour changed. At the beginning of the Middle Ages a double edged slashing sword was used but as time went by it evolved into a stronger, diamond-shaped sword that could thrust between the rings of chain mail more easily. There were many different types and styles of Medieval swords which formed part of the Medieval Swords history the names of the different Medieval swords included the Broadsword, Falchion sword, Longsword, Scimitar, and Greatsword. The different types of Medieval swords ranged from the smallest Broadsword measuring from 30 inches to the Greatswords which measured up to 72 inches. The weight of Medieval swords are usually presumed to be a lot heavier than they actually were! Facts and a description of the different types of Medieval swords follow. For full details click on the appropriate link. The Longsword aka as the Bastardsword - Longswords (Bastardswords) are also known as Hand and a Half swords. The length of the Longsword (Bastardsword) ranged from from 44 to 50 inches in length. Skill in the use of Medieval weapons and understanding the strategy of Medieval Warfare was necessary and a played a vital part in Medieval life. The training required by a Knight to use Medieval Swords was extremely time consuming - it was necessary for them to become expert Medieval Swordsmen. Special places were assigned for the Medieval Swords training called the Pell. Pell training allowed knights to practise various vicious strokes and manoeuvres with their Medieval Swords such as thrusting, cutting, and slicing without imposing an injury on his opponent. Knights in Training Combats used swords called batons. A sword training combat was settled by either a set number of counted blows, or until one or both combatants had been “satisfied” i.e. had enough. Certain blows or manoeuvres using the training swords, batons, were allocated set numbers of points. A Medieval sword also held great symbolic importance and featured strongly in the formal Ceremony of Knighthood. This symbolic meaning was even illustrated in the Medieval swords design as the crossguard (quillion), formed across the handle of the sword, resembled a Christian cross. Giving a Knight the 'Right' to use the sword in defence of the Christian religion. 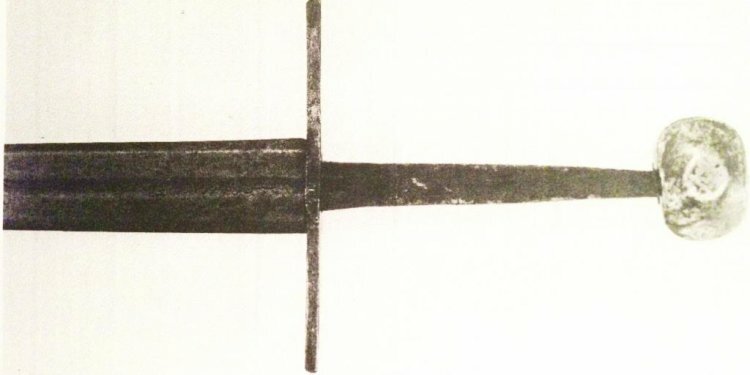 Medieval swords also featured some form of engraving. The engravings on Medieval Swords might include the sword owner's name and words from a prayer. Engravings might also be purely decorative and embellished with the inclusion of jewels.